O/o District Commandant, Home Guards, Nagaon. Application are hereby invited directly from the intending Home Guards Volunteer of Nagaon and Morigaon District for Temporarily engagement dunng the ensuing panchayat election 2018 under Dispol Nagaon & Morigaon District. 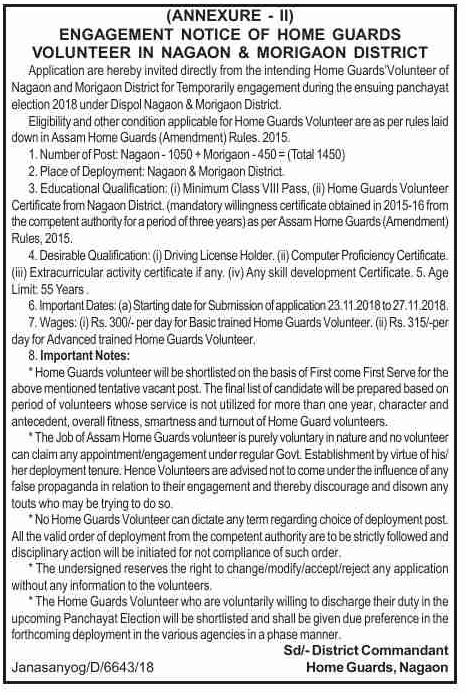 Eligibility and other condition applicable for Home Guards Volunteer areas per rules laid down in Assam Home Guards (Amendment) Rules. 2015. (ii) Home Guards Volunteer Certificate from Nagaon District. (mandatory willingness certificate obtained in 2015-16 from the competent authority fora period of three years)as par Assam Home Guards(Amendment) Rules, 2015. (i) Rs. 300/- per day for Basic trained Home Guards Volunteer. (ii) Rs. 315/-per day for Advanced trained Home Guards Volunteer. b) Last date of application: 27.11.2018. Important Notes: Home Guards volunteer will be shortlisted on the basis of First come First Serve for the above mentioned tentative vacant post. The final list of candidate will be prepared based on period of volunteers whose service Is not utilized for more than one year, character and antecedent, overall fitness, smartness and turnout of Home Guard volunteers. The Job of Assam Home Guards volunteer is purely voluntary in nature and no volunteer can claim any appointment/engagement under regular Govt Establishment by virtue of his/ her deployment tenure. Hence Volunteers are advised not to come under the influence of any false propaganda in relation to their engagement and thereby discourage and disown any touts who may be trying to do so. No Home Guards Volunteer can dictate any term regarding choice of deployment post All the valid order of deployment from the competent authority are to be strictly followed and disciplinary action will be initiated for not compliance of such order. The undersigned reserves the right to change/modify/accept/reject any application without any Information to the volunteers. The Home Guards Volunteer who are voluntarily willing to discharge their duty In the upcoming Panchayat Election will be shortlisted and shall be given due preference in the forthcoming deployment in the various agencies in a phase manner.